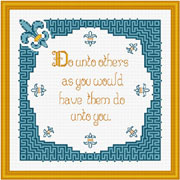 The wording of the ‘Golden Rule’ is depicted, framed by fleur-de-lis and a geometric border. Back stitches and whole stitches are used. Floss may be changed.